A close relative of E. lemmonii, this species differs in its smaller, bright yellow flowers and generally more slender aspect, with smaller buds and receptacles. It is found in open areas of oak woodland and related vegetation types to the west of E. lemmonii, and at higher elevation. The California Native Plant Society Rare and Endangered Plant Inventory lists it as the San Benito poppy, for its presence in that county. PLANT annual, 0.5-3 dm tall, erect, sparsely hairy. LEAVES basal and cauline, terminal divisions generally obtuse. INFLORESCENCE cymose or solitary. 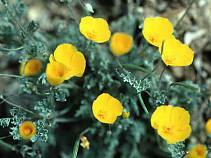 FLOWERS nodding in bud; receptacle barrel-shaped; calyx pointed, hairy; petals 1-2 cm long, yellow with orange spot at base. FRUITS 3-7 cm long. SEEDS 1-1.3 mm diam, spherical to ellipsoidal, reticulate, brown. 2n=12. UNCOMMON. Grassy areas in woodland and chaparral; 500-1500 m. South Coast Ranges.